Hasankeyf, Batman, Turkey, By Nevit Dilmen [GFDL (http://www.gnu.org/copyleft/fdl.html) or CC-BY-SA-3.0 (http://creativecommons.org/licenses/by-sa/3.0/)], from Wikimedia Commons. A complete, exceptionally rare, and beautiful stone figure of a woman has been found at Çatalhöyük in Konya province, Turkey. The statue is estimated to be 8,000 years old Çatalhöyük is a Neolithic and Chalcolithic site dating from about 7500 to 5700 BCE. Its eighteen level of settlement have left behind a large mound, the remnant of a town of 5-7000 people with houses so closely clustered together that roofs became streets and pathways. Excavators have found murals and relief figures depicting men and animals as well as abstract forms and designs. Numerous female figures made of clay have been found at Çatalhöyük, prompting some late 20th century authors to postulate the existence of an ancient “mother goddess” culture, although actual evidence for that is scanty. The find was announced by Stanford University Professor Ian Hodder, who discovered the 7-inch-tall statue under a platform, along with a piece of obsidian, suggesting that it was some kind of ritually associated placement. Dr. Hodder pointed out that the figurine’s pendulous breasts and paunch suggest the appearance of an older woman of high status rather than a mother. Ben Bender [CC BY-SA 3.0 (https://creativecommons.org/licenses/by-sa/3.0)], via Wikimedia Commons. The Ilisu dam project to contain the waters of the Tigris will force out residents of the town of Hasankeyf and cover the remains of at least 300 sites and 12,000 years of history under 200 feet of water. When completed, the dam is expected to generate 2 percent of Turkey’s electricity supply. The dam project began in the 1980s and has been delayed many times, notably in 2009, when European backers withdrew its funding over the damage the dam would cause to the area’s cultural heritage. Turkish archaeologists say that although salvage archaeological work has been ongoing, 85% of the sites in the area will be submerged before work can begin on them. 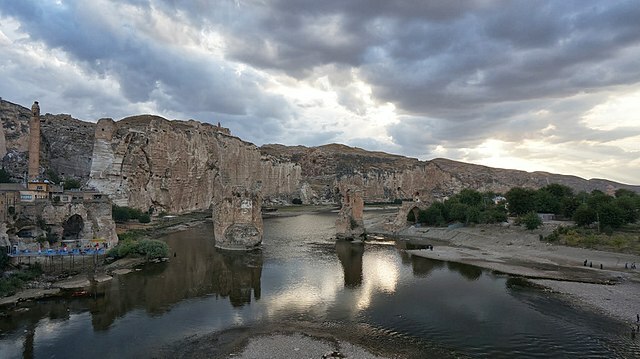 According to an extensive article in National Geographic, an alternative plan for five smaller dams that would leave Hasankeyf intact received no response from the government. The Turkish central government has pushed the Ilisu dam project forward regardless and says that it will be completed this year. 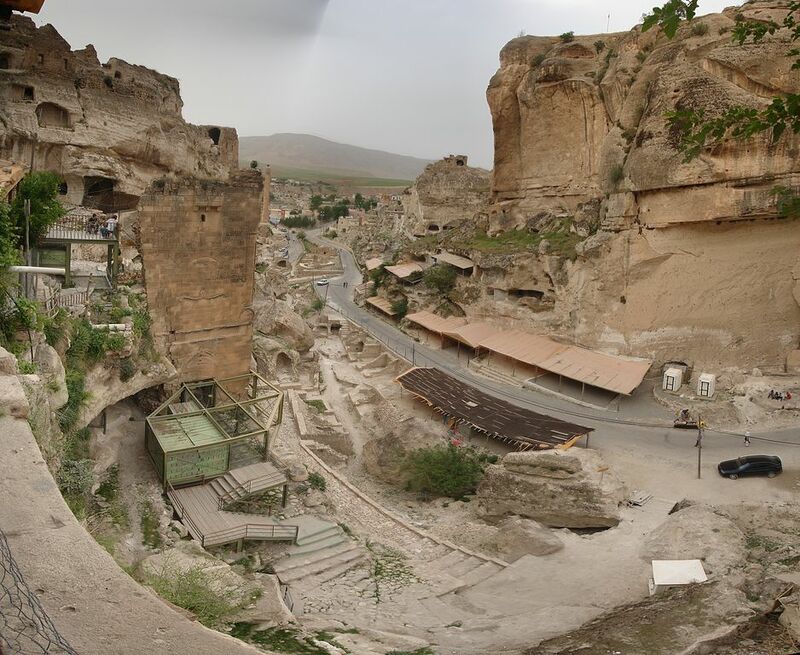 The area around Hasankeyf has been occupied since the earliest Mesopotamian period, and the remains of ancient cave dwellings sit near a medieval citadel, not far from an Artuqid bridge, constructed by a Turkmen dynasty that ruled in Eastern Anatolia in the 11-12th century. Hasankeyf’s town residents are poor; most make their living from sheep-herding or rug weaving. The Turkish government has built a new town of apartment complexes on higher land above the dam site, but many of the people of Hasankeyf refuse to move, saying they love the homes and orchards built by their grandfathers and great-grandfathers. They say they will never be able to pay off the loans the government will make for them to buy the new apartments, which will cost about eight times the value of their current homes. Environmentalists have voiced serious concerns as well. When the project is completed, the reduction in water flow is expected to dry up huge areas of marshland in southern Iraq and to collapse that region’s traditional ecology and its wetland subsistence economy. Organizers of the fifth annual Çanakkale Biennial, a contemporary art exhibition, scheduled to start on September 24, have cancelled the event in fear of a crackdown by President Tayyip Erdogan’s government against free expression. In the past, the municipality of Çanakkale was the biennal’s biggest sponsor; this year the president’s party, the AK Parti, issued a press release demanding the city fire the biennale’s director Beral Madra and name her as persona non grata in Çanakkale. Ms. Madra resigned as art director and co-curator at the same time the cancellation of the biennal was announced.